The Cocovore’s Fallacy. How a German Escapist’s Coconut Utopia Went to Hell in a Handbasket. 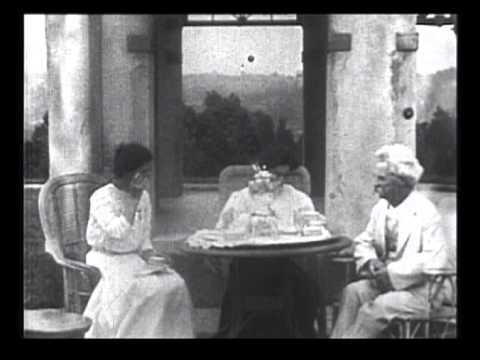 Screenshot from the 1909 Edison film below. I tried surf-bathing once, subsequently, but made a failure of it. I got the board placed right, and at the right moment, too; but missed the connection myself. The board struck the shore in three-quarters of a second, without any cargo, and I struck the bottom about the same time, with a couple of barrels of water in me. None but natives ever master the art of surf-bathing thoroughly. It may be unlikely, but it’s quite possible that some of these mammoths crossed beneath the feet of American novelist Herman Melville while he was aboard a whaling ship in the 1840s, unwittingly researching his forthcoming tome. Bowhead whales (Balaena mysticetus) are baleen whales that can grow up to 60 feet long and weigh just as much in tons. Their heads, over a third the size of its body, are built to smash through ice–up to a foot-and-a-half thick–on their way to the surface. They’re also the longest-living mammals on earth (the oldest ever to be aged was 211), and a few who are still alive today were plying the Pacific around the same time Herman Melville was stumbling around the deck of a Yankee whaling ship and penning his classic tale of the elusive white whale. The Cultural Lives of Whales and Dolphins, Hal Whitehead and Luke Rendell, 2014. Killer whales are xenophobic dupes. Bottlenose dolphins are rapists. We’ve come to accept these highly intellectual social constructs in other mammals, but can we come to understand that if other mammalian societies have such organized complexities, that perhaps they have implications for humankind, too? These are the questions posed by Hal Whitehead and Luke Rendell, authors of The Cultural Lives of Whales and Dolphins, and Carl Safina in his latest book, Beyond Words: What Animals Think and Feel. The Cultural Lives of Whales and Dolphins by Hal Whitehead and Luke Rendell–two lifelong cetacean researchers–explores the very divergent cultural constructs of orca (killer whales–dolphins, actually) and sperm whales. Above: Shackleton’s Royal Geographic Society Silver Medal (1904) and a photo of the young, strapping explorer. Image: Christie’s South Kensington. Throughout his brief life and career, Sir Ernest Shackleton, who, enchanted by literature but bored with school, left formal education behind to join the Merchant Marine at the age of 16. He wouldn’t set sail on his first exploratory expedition until July of 1901, when he was selected to join Robert Falcon Scott’s Discovery Expedition, the first British voyage into the Antarctic for 60 years. Shackleton was sent home by Scott, with whom he was reported to have ill rapport (Scott only sighted that Shackleton was ill). Still, Shackleton wanted to continue his exploratory endeavors, and four years later set sail on what is generally accepted to be his most successful campaign, aboard the Nimrod. Shackleton went on to earn over 40 medals and awards throughout his career, and on October 8th, 15 of them will be put up for auction by Christie’s in South Kensington, England. Literary works about the sea can’t help but conjure romanticism in their readers, and other significant realities–terror, for one, but seasickness and sheer boredom, especially, are all very real parts of the equation as well. You’d like to think there’s always something happening aboard a ship in the middle of the ocean–and there is–but most often it is a cyclical list of mind-numbingly monotonous tasks you’d encounter keeping house, too, like scrubbing decks (that’s floors, landlubbers) and washing dishes. Such was the case for Professor Jasanoff, who first set out to retrace a historical trade route aboard a bunker-oil-chugging containership, but that included “the comforts of a queen-size bed, round-the-clock hot water and a mass of steel as big as the Empire State Building between me and the sick-making swell.” Reading deeper into Conrad, she felt she’d missed the point. She would have to go by sail.